The analysis of behaviors conveyed by human communities pursuing a common goal has loomed large on my mind. That is, how either a country or a company, and even a couple, are expressing themselves as a social wholeness. Upon several characteristics by which these systems are known, the cohesion and conflict traits are sweeping in scope, and emotiveness is a relevant one. Thus one of the most appropriate instances for gazing sensible connections among these collective beings, are large spectacles which assemble a substantial number of people, i.e., concerts, religious conventions and sporting events. At the last one where the cult of soccer is placed, there is an irresistible chance of analysis, even further regarding the world cup post depression symptoms which usually drive us to think about either what it was or what it could be. Therefore I want to take a look at the “Yellow stain”, the Colombian collective being which was named that way since it put the team shirt trying to flee from its upsetting politics reality by feeling happiness and passion, having good conversations, and being connected around the recently concluded Soccer World Cup. 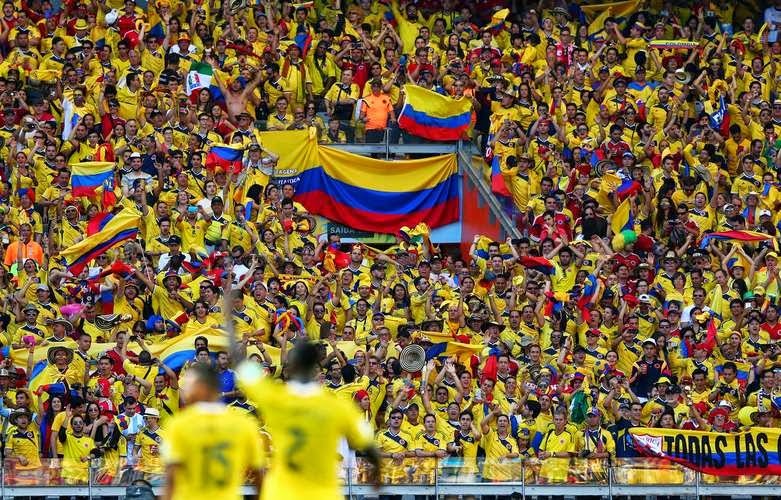 Likewise, I strongly believe lots of Colombians got involved in such spiritual and physical experience, mainly those who had the privilege of being present to worship their team over the several Brazilian temples of Soccer. When I am referring to the yellow stain as a collective being, I am not using it as a simple metaphor. This systemic expression got life throughout the Colombian consciousness whereby its body, thought and language were materialized. We clearly gazed its physical shape both in Brazil and Colombia. It danced like the players when they scored a goal. Eventually we saw it at every corner down the cities, at home, at the companies. It celebrated victory and it was sad with defeat. Then, it lined down the streets for welcoming their 23 sons and his leader as if they had won the cup. Lots of its mind expressions were shown upon social networks, mostly on Twitter, the suitable net for identifying collective conversations. Hashtags like: #ManchaAmarilla, #HinchasInseparables,#GraciasMiSeleccion, among many others, demonstrated it. It is possible to fathom such phenomenon through the interesting Memes theory (replication of the collective memory). To summarize, this hypothesis states that cultural spread -chiefly exposed on language and other inherent cultural manifestations from each society- is analog to genetic transmission and hence it can have an evolutionary effect both on individuals, communities and societies. If this theory is overlapped with the yellow stain, what we did was create a meme or social memory moving onward to the next generations of Colombian partiers who will celebrate with victory and will suffer with defeat of the Colombian team. Finally, it cannot be ignored the yellow stain is a phenomenon which has positively touched to Colombia by showing its nice side around a sporting scenario. However, we should be aware of this newborn organism is for now, just an emotional idea. The growth of this movement in something further transcendent than soccer depends on us, the Colombians who want to live in a good country. Nobody has said it is easy, many times we prefer to take the pill for avoiding the ill but it will still there. I think it would certainly worth regarding both the social disintegration and the no memory as two of the most influential memes from our country. María Jimena Duzán (Column), Semana´s Magazine. “The Power of Soccer” (EL PODER DEL FÚTBOL) Edition N° 1679, July 2014. The World Cup 2014 was the biggest social media event ever seen before. The meme expression has taken popularity as a trend on Internet of spreading messages, pictures and videos. It was stated by the scientist Richard Dawkins on his book The Selfish Gene. Check this out: Which country does the most good forthe world? TED Talk by Simon Anholt.